Are you losing your hair abnormally? If yes, then not to worry at all because now you can get rid of your hair loss issues on a permanent basis. 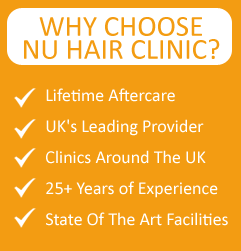 Find the right sort of hair treatment in Leicester to fight hair loss. It is true that there is a lot of hair loss solution in Leicester that are expensive to afford. However, our clinic provides affordable and reliable solution to help you to get back your lost hair. Hair loss is a common condition that affects most of the people today. More than half of men and women in Leicester are now affected with hair loss. Androgenic alopecia also known as male-pattern baldness is a hereditary issue that affects 80% of men. Women can also suffer from androgenic alopecia that is general hair thinning on the crown. Some other hair loss conditions are alopecia areate that is patchy baldness, hair loss or thinning due to stress, dietary issues and others. Surgical hair transplant procedure involves removing hair from the donor sites and implanting them into the recipient areas. In other words, hair transplantation is a surgery that involves removing a strip of hair-bearing scalp from the donor area and using it to fill the recipient area where there is less or no hair. Most of these procedures are performed under local anaesthesia. To treat hair loss there are many safe and less painful surgical procedures such as FUE and FUT hair transplant.